For less than $12 million, Tampa bought itself a first class peoplemover monorail. Tampa was Bombardier's first contract using UMIII technology. 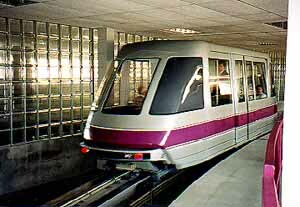 This was also their first totally automated monorail. Bombardier supplied six single-car vehicles, track and a five-year extended warranty. The pinched loop system consistently provides better than 99.5% reliability. Attractive glass tile stations are located at the terminal and in the parking lot. Easy to understand graphics and TV monitors help passengers find their way to destinations. Tampa has the distinction of having the first monorail in the USA to use active switches as part of the main line. The monorail also is different in that the entire guideway is built inside the parking lot and terminal structure.